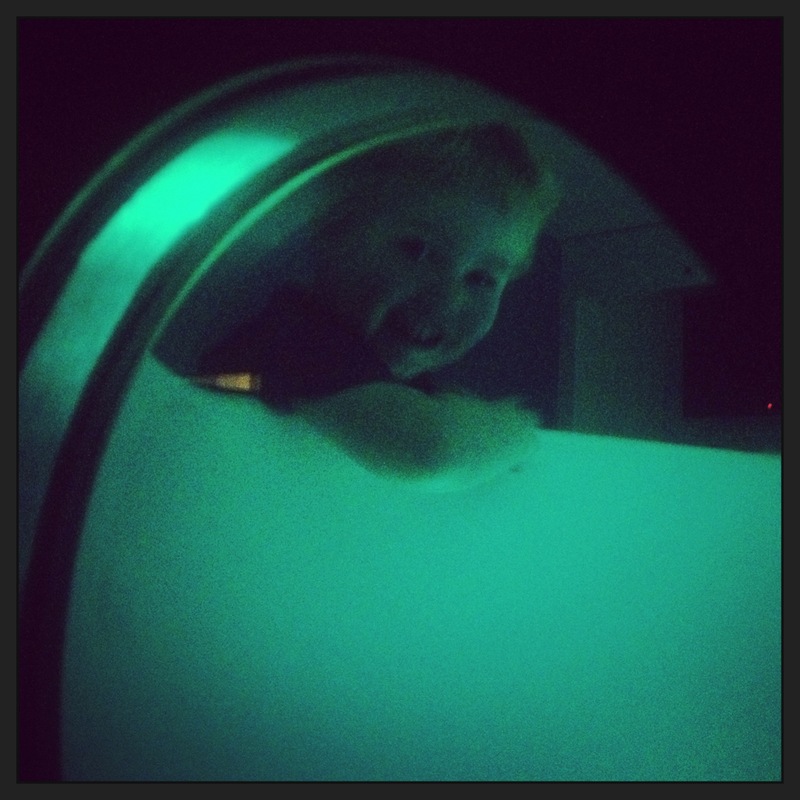 Mum for Fun | Tales of Toddler Fun from a Full-Time Working Mum (in Milton Keynes). 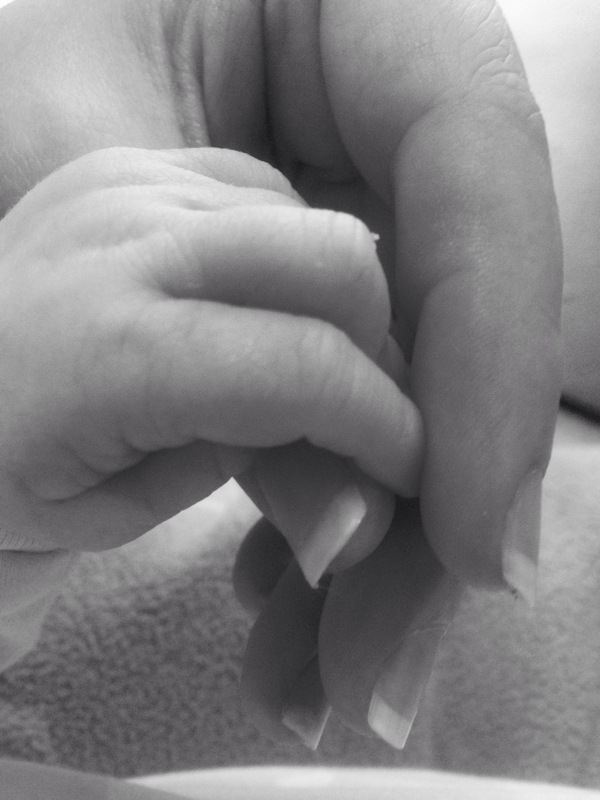 Tales of Toddler Fun from a Full-Time Working Mum (in Milton Keynes). 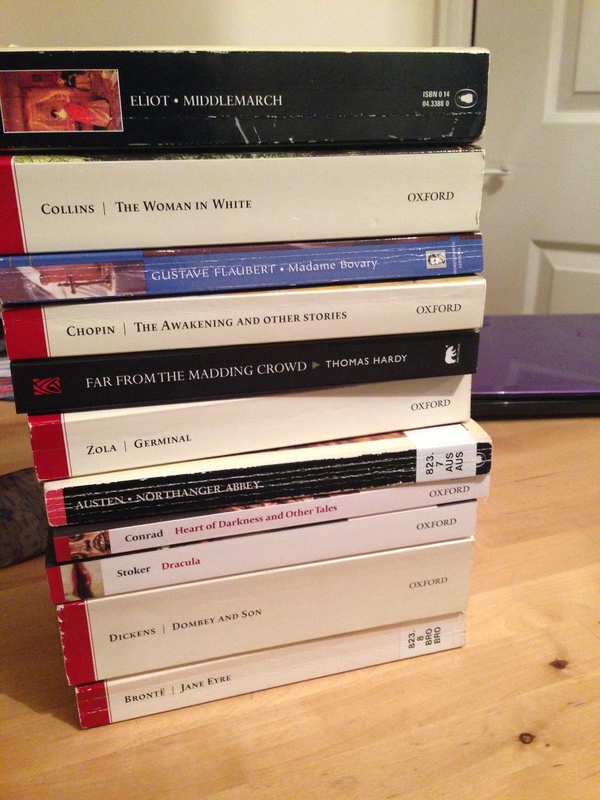 In late June this year, I made the decision to study an Open University literature module: AA316 The Nineteenth Century Novel. Reading is a passion of mine, and as I have grown up I have become more and more interested in history, therefore 19th Century literature covers both the history of the Victoria Era and reading classic novels that I have always said I would read…one day. Well doing a course, kind of forces you to read the books you wanted to read anyway, so what a great excuse. The only problem is that I signed up by the beginning of July, and in the notes it suggests reading ‘as many of the set-texts before the course begins’ in October. After reading the OUSA forums I realised that I should definitely read them all as the course-load is very heavy. So my summer challenge was to read 12 classic novels in 12 weeks, anyone who is good at Maths would have worked out that this meant 1 book per week! Gulp! I usually get through 1 book a month, and that is usually a light-hearted Bill Bryson or Sophie Kinsella. So how was I possibly going to find the time to read all these books around a full-time job and a demanding toddler? You would not be able to pick up a book during any of those situations above, and therefore I found new pockets of time and thus I did actually read 12 classic novels in 12 weeks – amazingly! It was hard-going at times, especially with my least favourite novels, but I feel proud now that I have accomplished this task – what is it about reading classics that makes us feel learn-ed/intelligent etc? Jane Eyre by Charlotte Bronte – I’ve seen the movie but as always, the book was even better! Germinal by Emile Zola – I cannot say I “enjoyed” this book because it is so gruelling and harsh, but what a powerful and thought-provoking novel! Middlemarch by George Eliot – just wonderful. Woman in White by Wilkie Collins – exciting and riveting like an old fashioned spy-tale. Portrait of a Lady by Henry James – in my mind this was a book about nothing: a young lady chats rubbish in England then in Florence…the end. The Awakening by Kate Chopin- the only positive aspect about this book is that is is short! Dombey and Son by Charles Dickens – when I first listened to all 36 hours of this book, it was the hardest slog, but now I am learning about the history of the book and the time it was written in I have a new appreciation and do not dislike it as much. I also read Dracula, Far from the Madding Crowd and Heart of Darkness – all fine, but not massively note-worthy. Except to say I wish Dracula would have been better, but that is probably my being ruined by all the current vampire literature. Last year, hubby and I had a lovely break in Brockenhurst. It was so amazing that we decided to return to the new forest, but a different part. This time we stayed in a B&B just outside of Lymington and used that as base for exploring other parts of the forest. I was initially hoping that Lymington would be the perfect mix of both the ‘new forest’ and the seaside, which is why I chose it, as Brockenhurst was a bit far from the sea, however Lymington doesn’t really have the new forest feel, there are no wandering ponies (which in my mind what is most special about the new forest) and the seafront is not the most picturesque of places, plus the beach is shingle. However, we didn’t let that deter us and instead spent time in Lyndhurst and Burley. However, before I discuss those I do need to say how absolutely amazing the food was at a pub in Lymington called “Thomas Tripp”. The outside has pretty hanging baskets and is very welcoming, unfortunately when I stepped inside I was put-off as the ambience was not quite right, and didn’t look like a place that would have amazing food, but I am so glad I was wrong. Thomas Tripp had, undeniably, the best ribs and BBQ sauce I have ever eaten in my life! And as a foodie, I have to say I have tried a fair many. They were so unbelievable I had to talk to the owner about them, he explained that they are slowly cooked for like 12 hours, and he came up with the BBQ sauce recipe himself. It was so mind-blowing we actually travelled all the way from Lyndhurst the next day, just to eat there again. 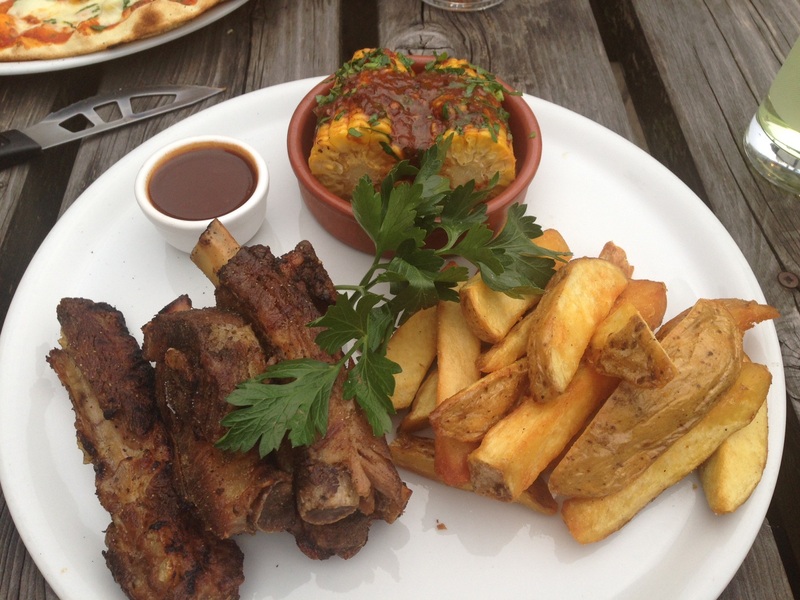 The ribs were not the only special things, the garlic and tomato bread must have been made by an Italian because I have only had better in Italy, and the chocolate brownie for dessert was absolutely scrumptious. So if you are ever in the New Forest, find this pub because you will not regret it. We spent a day in Lyndhurst, half of it shopping and half of it on the new forest open bus tour, which I highly recommend. We went on the red route, which was the longest at 2.5 hours. No matter how hot it is outside, if you are upstairs, in the open it gets very cold and windy, so bare that in mind. It was very beautiful and a great way to see the sights of the forest that we had yet to see. The only downside was that the bus did not have a toilet, which is tricky on such a long tour. 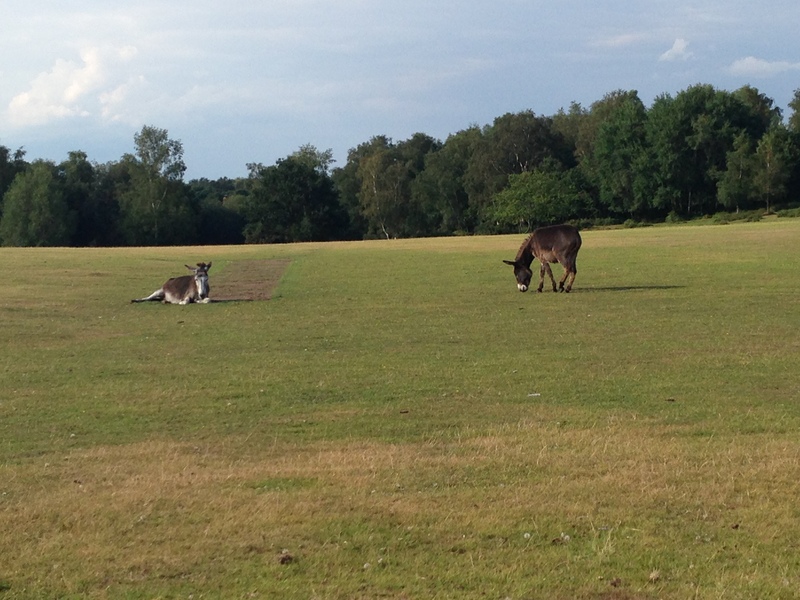 There were lots of great touristy shops in Lyndhurst, and if you walk just 5 minutes toward the outskirts, cross over a grate, and there are the ponies, and to my great surprise, wild donkeys. We only had time to stop off at Burley on our way home (as the New Forest Show was on), it was an intriguing little witchy hamlet. 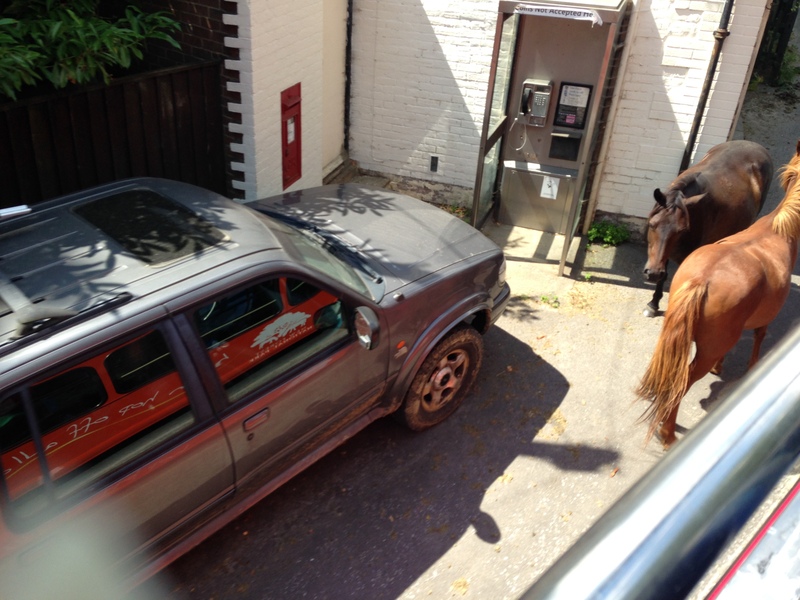 Again we were lucky enough to see 2 horses, waiting to use the payphone 😉 Burley was the smallest and probably the prettiest of the places we saw on the tour. If you like a bit of fantasy, this is definitely the place, as it has witches, smugglers and “dragons” in it’s history, and due to this many of the shops sell witch/fantasy themed goods. 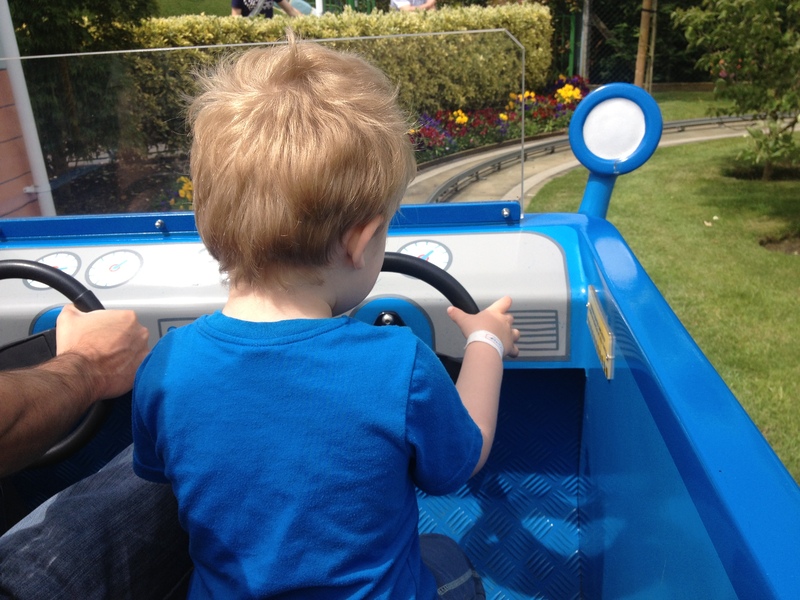 This year we decided the family holiday would be centred around our toddler, so when we saw Butlins advertising their ‘Just for Tots’ week, we were intrigued and decided to give it a go. Butlins was completely new to us, and I have to say that my original thought/stereotype was not a positive one, probably because of stories I had heard over the years about rowdy hen parties and such. I didn’t need to worry because it was more modern than I had imagined, especially the Wave hotel, where we stayed. Plus because it was a week especially for babies and toddlers, there were no hen parties or loud groups of party-goers, it was all families with young children. The hotel also has a big games room, but it wasn’t a positive for us because our toddler was too young to be able to play any of the games. In a few years that would definitely become a selling point. Butlins is well-known for it’s big-centre stage performances, with the red-coats and the special shows, but alas I was not able to see this for myself because, although it was ‘Just for Tots’ week, their nightly big performances still started at 9pm. One evening when I wandered out to get some snacks, I saw a very long queue and I thought, how are people able to do this? If you have a baby or a toddler how are you able to go out late at night? Do they take their babies/toddlers and let them fall asleep to the very loud music? Do they go alone and leave partner at home with the little one? That is what my husband and I do when we are at home, though it is not as fun on your own. Do they have family or friends with them who could babysit? Very good plan, we should try this next time. If anyone has the answer, please let me know as I am intrigued. Even on holiday our little boy was in bed by 7:30pm, mostly because he wouldn’t be able to stay awake any later anyway, and partly to keep him in his routine. Perhaps when he gets a bit older I won’t worry so much about bed times on holiday. 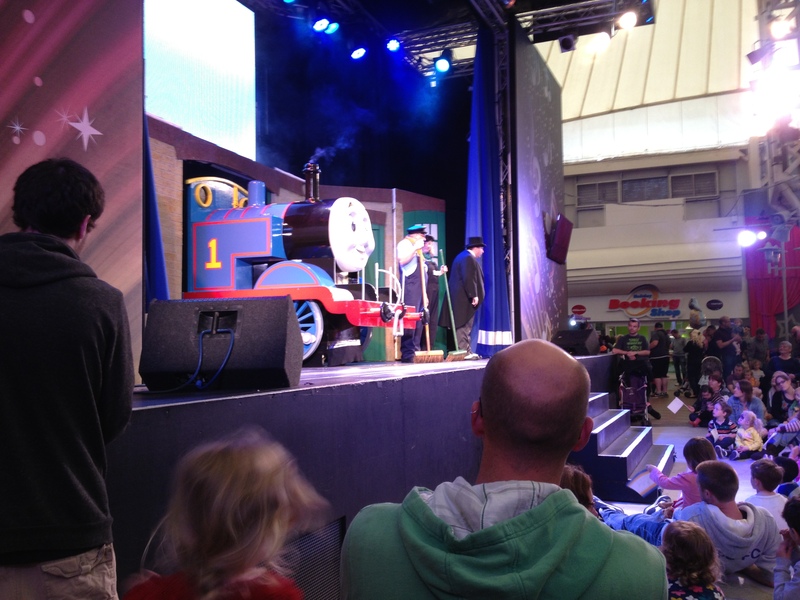 Theatre shows showing Thomas the Tank Engine, Fireman Sam and more. Nate enjoyed these, although not as much as I thought he would. Puppet Show – there was a puppet theatre showing a variety of shows, including “Monster’s Got Talent”, they also have a session where you can play with the puppets. Nate enjoyed the puppet show but wasn’t interested in playing with them. In-door play area – Nate enjoyed this on the first day, but the next day he was told he was too short to go in, even if I went with him, this made him cry his little heart out. My toddler is quite tall for his age so bare in mind the average 3 year old wouldn’t be tall enough for what looked like a pretty standard soft play (100cm or taller to be allowed in). The side for babies and young toddlers was tiny, Nate barely played there for 5 minutes. This was disappointing. Little Tikes land – this was superb, it is a race track filled with every little tykes vehicle you can think of, with slides, play-houses, wet-play and even a little castle around the track. Fairground rides – a major perk that these are free, downside is the outdoor ones are only open for 4 hours a day, which we found very limiting and therefore didn’t really get to try any of the rides due to it being closed, closed because of weather or long queues. The indoor rides however were open all day, and therefore Nate got to ride them several times, and because of the lack of queues he got to stay on the one ride 4 times in a row, which he enjoyed. Swimming pool – this was fantastic, it had some great slides and water features, all of us really enjoyed that, and despite reviews I read elsewhere, the changing rooms were perfectly adequate and not too cold. Tots soccer – deep in his clingy phase so Nate did not play for long, which is a shame because he loves playing football usually. 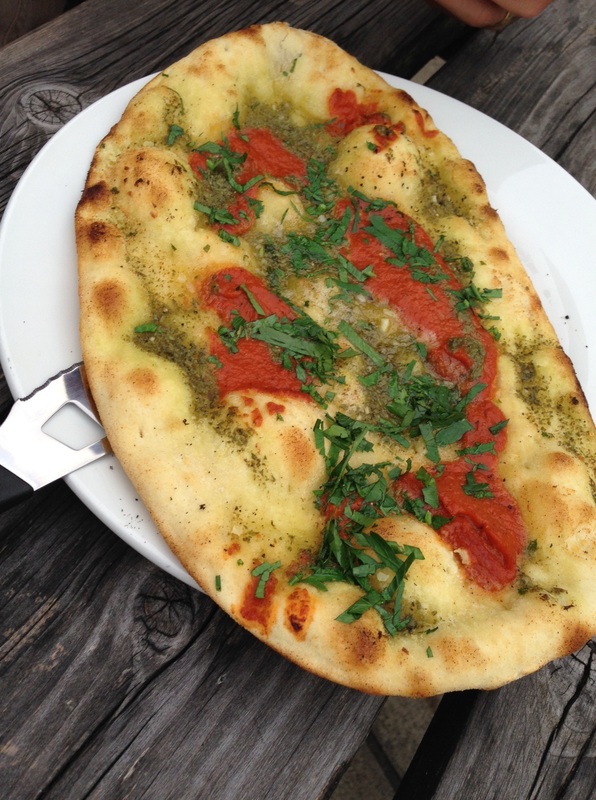 This was probably the biggest let down for us, because my husband and I are big foodies. On the otherhand, we were not expecting to eat amazing food at Butlins, so in all fairness the food was as expected. Probably the best food experience we had was breakfast at ‘the deck’ restaurant. It was opposite the wave hotel, so pretty convenient, and of all of the restaurants there that sold breakfast, it was the biggest, offered the most variety and tasted delicious. In the evenings we ate at Papa Johns (didn’t taste the same as the takeaway, so not as good), an american restaurant (too noisy, slow and didn’t care about my son) and on our last night ‘Beachcombers Inn’. We actually really enjoyed the beachcomber, not because of the bog-standard (although quickly served) food, but because it is right next to the park, and since it was a beautiful and warm evening we took the seats right next to the entrance and enjoyed our meal while Nate played. It was the perfect ending to our holiday. My final thoughts on Butlins are that if your child is of the right age and personality to enjoy all the activities on offer this place will definitely keep them busy. The Wave Hotel was wonderful and in general it was much more modern than I thought it would be. *We paid for this holiday ourselves. 1. 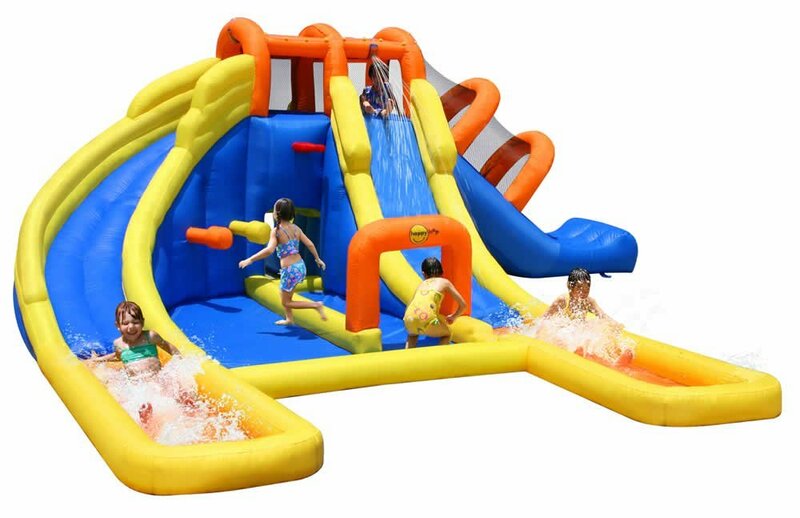 Most expensive/splashing out (excuse the pun)/longer-lasting: It actually looks too fun, like I might ‘accidentally’ spend a whole day playing on this myself! So if you have come into some money, or are eloping to a part of the world where it is sunny every day, what a perfect paddling pool/bouncy castle for your large garden! 2. 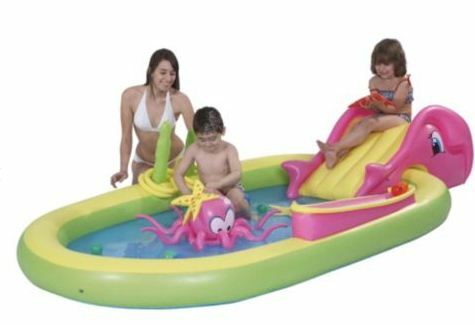 The cheapest: This is the standard 3-ring paddling pool that you can usually pick up from most places for less than £5. We bought ours from Asda, in store for about £3 last year. 3. The one we almost bought: I liked the idea of the slide, especially when one reviewer said that she (the mum) would lay on the slide as it was great back-support! We almost bought this one from Tesco, but were disappointed by the fact that you cannot collect the same day with Tesco-Direct. 4. The one for a baby/younger toddler: I like this one for babies because it has a sun-shade which is perfect for protecting a baby’s skin. 5. The one we did buy: This one just seemed perfect for my toddler who loves all things transport, and after a happy afternoon with him sliding in and out, running around, splashing and laughing I would say our money was well spent on this one. It did take some time to blow up without a pump, so don’t forget to purchase one of those too. There is also a useful enclosed section that would benefit from some balls, luckily we already had some. 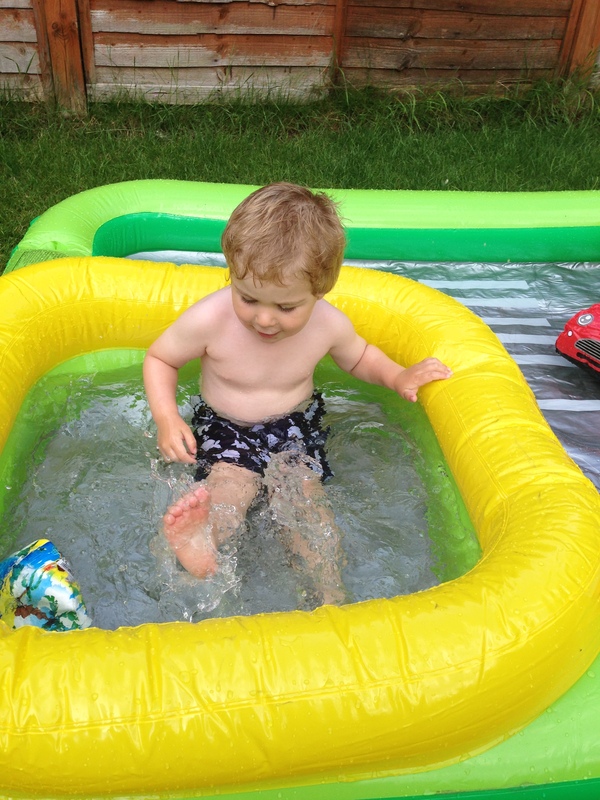 We now call it the hot tub (because it does look like a mini hot-tub), which when filled with much warmer water is perfect for mummy to sit in with legs dangling over the side. 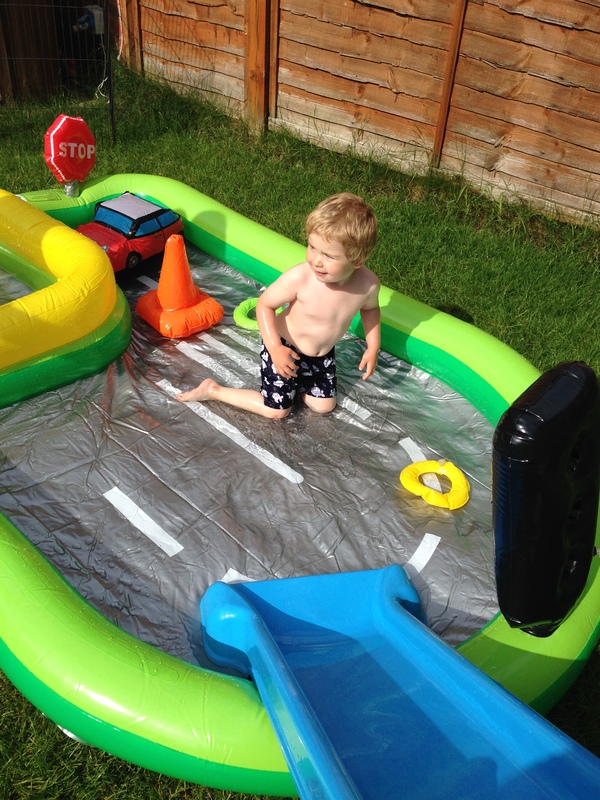 The upside of purchasing this one from Argos is that we could collect it the same day, so when we awoke on a Saturday morning to brilliant sunshine we popped straight over to Argos to buy it, and Nate was playing in it later that morning. 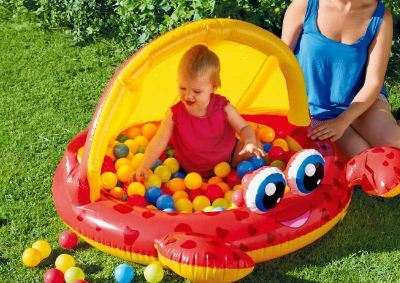 It comes with the addition of pool toys and floats including: a hoopla game, a blow up car, stop-sign and traffic lights and you can attach your hose to it and sprinklers come out of the side. (The blue slide in the picture is ours and does not come with the paddling pool). Peppa Pig World – with a toddler! On our last day of our Butlins (Bognor Regis) holiday, we decided that we would stop off at Peppa Pig World for the day, on our way home. This was our first trip to a proper theme park with our 2.5 year old toddler, so we were uncertain as to what to expect. 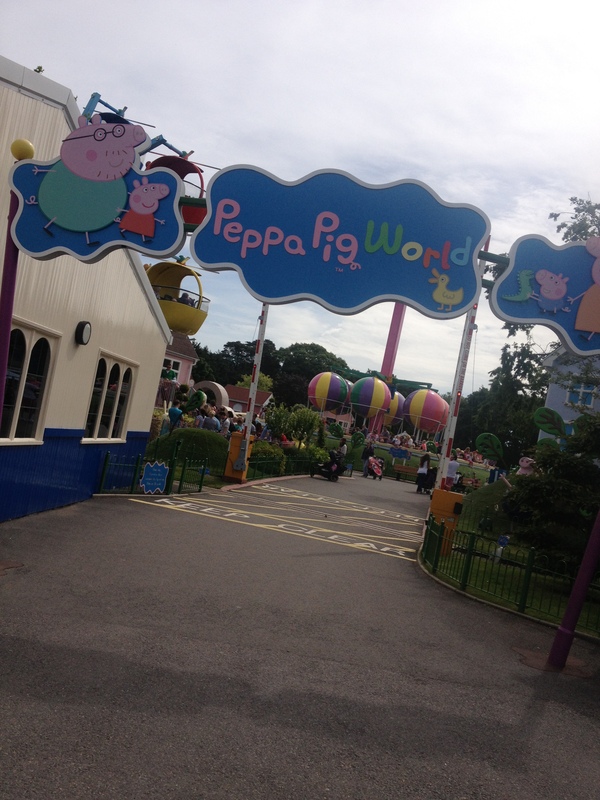 Firstly, Peppa Pig World is a clean and pretty little part of a larger theme park called Paultons Family Theme Park. There are only about 8/9 Peppa Pig themed rides, however, I feel that is sufficient for a day of activity. Unfortunately we did not get to try all of the rides, because either the queues were too long, or Nate decided he didn’t want to go on them. Parking was easy enough, but it was quite a trek from parking to the entrance (where you pay), fairly long queue’s to get in and then you have to walk through the whole of Paultons Park to get to Peppa Pig World, so if you have a young child, you may want to take a buggy or baby carrier. There is ample space for pushchairs to be left at every ride, so I am glad we decided to take it in. Please note that there are not baby changing facilities in Peppa Pig World, but there is one outside to the left, and it was pretty good and spacious. I felt the price was too high if you only intend to go to the Peppa pig section of the park (like we did), I think they should have a separate and lower price for Peppa Pig users only (although I understand how they are very unlikely to do this, financially). I am glad that Nate was under 100cm (just) and therefore didn’t have to pay the £27 full price ticket that each of myself and my husband had to pay. They do sometimes have special offers and is worth checking the website before you go, it is also cheaper if you book online. Being completely honest, I think Nate was too young to really enjoy the park, or perhaps it is just his personality, but the idea of queuing for a 2 year old, is just not something he can comprehend. 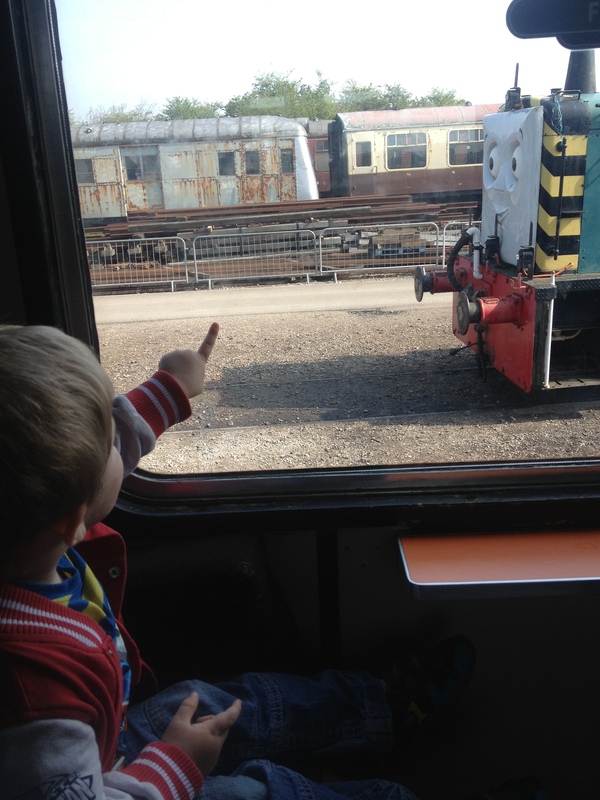 I am sure if we went with friends and their kids, he would have been more entertained, but he really did not like queuing and was not shy about letting us know it – several tantrums ensued. What further irritated him was that he was not allowed to stay on the ride for more than one go (which is obvious to us adults, but try explaining that to a 2 year old). He went on Grandpa Pigs train ride, Daddy Pigs car ride, Grandpa pigs boat trip (shortest queue) and George’s Rocket – indoor play zone (no queuing required). He enjoyed all of them, and really wanted to try the helicopter ride, but the queues for that were 35 minutes long all day and I knew he would not stand through that. There was also a peppa pig playground that he enjoyed and a muddy puddles wet play at the back of that, but he was too tired by that point to try it. All in all, we enjoyed our day and may try taking him back again next year when he is more queue-friendly. Over the Easter weekend Buckinghamshire Railway Centre ran their ‘Day out with Thomas‘, which they do about 3 weekends a year. The last time they did this was in September so we have waited a long time for this. 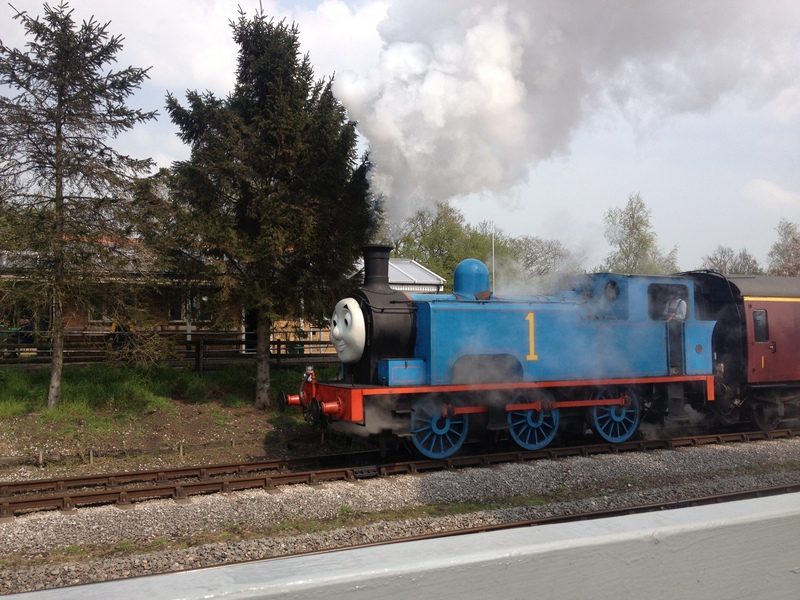 The cost was £41 for 2 adults and 1 child over the age of 2, so it wasn’t a cheap day out, but I have to say it was worth it to see the look on my son’s face when he saw Thomas for the first time! He loved it! The journey from Milton Keynes was not too bad, it took 50 minutes (it is near to Aylesbury). We went on Bank Holiday Monday and arrived at 10:30am, exactly when it opened, which was a good time because there was no queuing for tickets and we didn’t have to queue to ride on the Thomas train (there was a long queue for the rest of the day). So the first thing we did, of course, was to ‘meet’ Thomas and ride on the Thomas train, which Nate loved! I was surprised by how very comfortable old steam trains are, I would love to try it on a longer journey. Be aware that the train ride is very short. The ride goes in one direction for 2 1/2 minutes, goes back and then repeats so the entire journey lasts for 10 minutes in total. It’s a shame that you don’t get to see much of the countryside, as the train turns back as soon as you start to see fields, but we all enjoyed it anyway, the steam and the chugging was all very authentic, plus how often do you get to ride on a real steam train? After riding on the Thomas train, and spotting Toby on the way, we headed towards the miniature railway, and after about 10 minutes of queuing we had a ride, which we all enjoyed, perhaps even more than Thomas. This was because it was open air, it was a longer journey, it was pretty and was full of little characters all along the journey such as Winnie the Pooh, Noddy, Fireman Sam, Bob the Builder and more we also got to go through a tunnel. We stopped here for a picnic and and Nate watched the trains go round on the model railway. There were various other activities going on through the day, there was an open top train ride, face painting, a balloon show, colouring activities, a mini cinema on board a train showing Thomas, meet the Fat Controller, some toy train sets to play with and more. There was a restaurant inside selling food, which we didn’t try because it was too busy, there was also a chip van and several picnic areas. We stayed until about 2pm, so there were enough activities for a half-day visit, probably not enough to keep you out all day. Nate was so tuckered out he fell asleep straight away and slept the whole journey home. The next ‘Day out with Thomas’ is in early July and then again in early September. There is also a ‘Postman Pat’ day in May and a ‘Peppa Pig’ day in June.